When it comes to political news, The Hill has had an unusually strong election season already, surpassing rival Politico for web traffic and boosting its staff by 25 percent in recent months. To continue that momentum, the Washington, D.C.-based site is expected to take the wraps off a Hispanic-focused vertical on Tuesday. Democratic presidential candidate Bernie Sanders, who's battling Hillary Clinton in an ultraimportant New York primary today, will be the chief advertiser on the new channel called The Hill Latino. To make it all happen, the web publisher is partnering with Latino Magazine for content and marketing. Latino Magazine editor Alfredo Estrada will contribute to the site, for example. Meanwhile, Rafael Bernal, a former managing editor at UPI, will lead The Hill Latino's editorial team. "The Hill's overall audience has grown by 125.5 percent from last year to roughly 14 million unique visitors a month," Bob Cusack editor in chief at The Hill, said in a statement. "With this initiative, we will combine our in-depth reporting of politics and policy with Latino Magazine's unique understanding of the Latino community to illuminate culturally relevant information to a broader community of thought leaders." 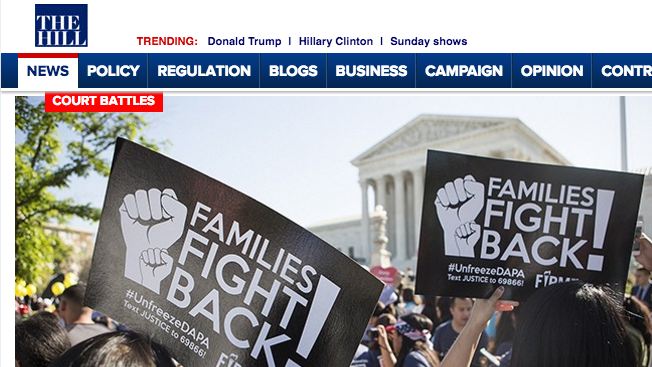 Sanders has pinned down The Hill Latino's launch sponsorship to include a native advertising component. And it's a national buy, so some New York readers will see the ads before they cast their ballots. It's the second time in the past week the campaign has made an interesting digital ad purchase. On April 14, Sanders ran the first desktop takeover ads to appear for a politician on The New York Times' homepage.